This morning I managed to crack 2700 on chess.com’s Tactics Trainer, so I decided to do a revised post on that, with some key updates and coaching advice from my last post on the website’s tactical features. I’ve used chess.com since my sophomore year of high school, with this coming November marking my fourth year of membership on the site. Aside from video viewership and Chess Mentor, one of the advantages of a diamond membership is unlimited tactics a day on chess.com. Since I started using the feature in 2012, I’ve attempted over 15,000 puzzles and climbed the ranks to reach 2700. It may not last long, but for now, I’m ranked one spot ahead of chess.com’s CEO, IM Daniel Rensch. So as a coach and an active player, how do I assess progress on Tactics Trainer? For most of my students, I believe that your tactics trainer rating minus ~200 points roughly represents your level of play. While that’s true for most 1400-2000 rated players, I think what TT represents after it gives you a 2400+ rating is very different from the original intentions of its functionality. For master level players, chess.com’s TT features are great for warming up or practicing calculation while on a bus, but it no longer serves as an exact gauge of your tactical ability. Since most of the puzzles are member-submitted, the target audience is usually 1500-1900, and sometimes even lower. Even chess.com’s bell curve shows the target audience for TT, and the number of players above 2000 are minuscule. 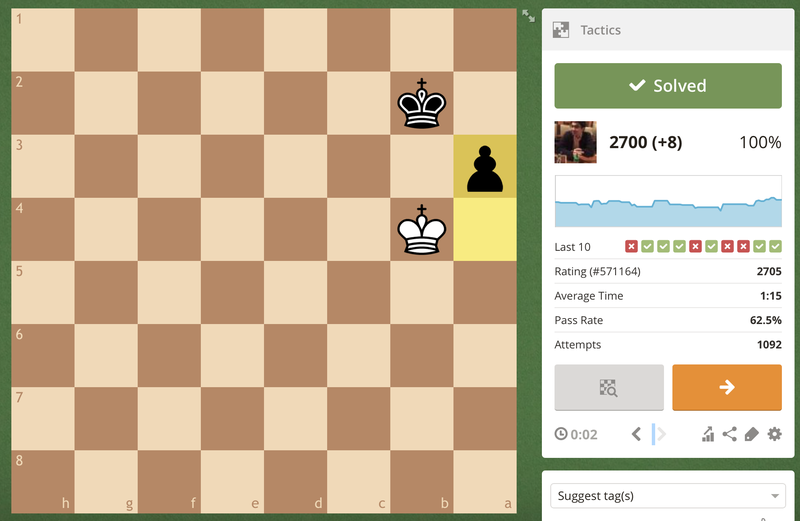 Chess.com does two things two things make Tactics Trainer more challenging for stronger members: Limit the amount of time to gain rating points and more endgame puzzles. Once you break 2400 on TT, the emphasis becomes much more on speed in a position where perhaps you have many different pleasant options, and you have to find the best one. Endgame puzzles become more frequent at the higher levels too, but often times, simply knowing opposition and achieving it on the board is enough to reach 50% of the solution, merely finding forcing moves and the right move order should be enough to earn the other half. Does this mean that Tactics Trainer is bad for top players? Of course not – you just have to realize that it won’t push you to be as creative as perhaps a position in Secrets of Chess Tactics because chess.com’s interface is programmed so that only one move can be correct. Which leads me to my next point. 1) You weren’t wrong, you just weren’t right. Often I find that when I make an error in a puzzle my line works perfectly fine, it’s just that it is simply not as good as the best solution. This may be frustrating but it’s important to understand why your answer wasn’t as right. 2) Move Order! Move Order! Move Order! This is the next rung down the ladder, as now we make the descent into actual mistakes and game-losing blunders. A move order error could simply fail to win as much material/checkmate, or even draw/lose to a discovered attack. This is one of the main tests TT offers, and what separates the complainers in the comments from the users that give answers. 3) Calculation Error… Now things turn sour. Maybe you left a piece hanging, or the endgame you were analyzing is actually a draw because you missed the critical in between move. Full board awareness is a skill, and you have to develop it by asking yourself one question…. 4) What can my opponent do? On some puzzles, the computer introduces the position by offering a move for the opposing side. Asking yourself why the opponent made that move and understanding his plan is the first step towards getting the answer right. Then you need to look for critical weaknesses and themes in the position. Is a piece overloaded? Is there a mating net? This can get you back on the right track. As a coach, there isn’t a student I haven’t recommended Tactics Trainer to. It teaches discipline while simultaneously offering a lesson in full board awareness. That being said, as a player trying to become a master, I have come to terms that while TT is a great resource to warm up, ease into a practice, and get in the mindset of calculating, it simply isn’t enough to bear the weight of all my tactical studies.